Before the Wilderness Certification Program students took a break for the holidays, we finished up with a jam packed week of fun. 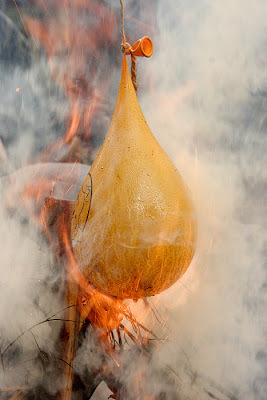 This included advanced firemaking skills, making fire from scratch. This time, students had to gather wild materials and try to create a friction fire totally from scratch. No saws or hatchets allowed! It was a wet, rainy day and made it especially challenging. Also, we had another wonderful day with Karen Sherwood, this time learning about decoctions and infusions. 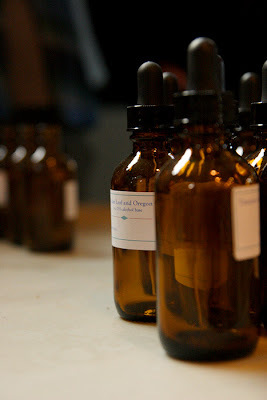 We started our day finishing up the process of making our tinctures. They had been saturating for weeks, and were now ready to be finished. First students filtered out the solids from liquids. Then, we bottled them up and shared. Just in time too, as many people were starting to feel the onset of colds! 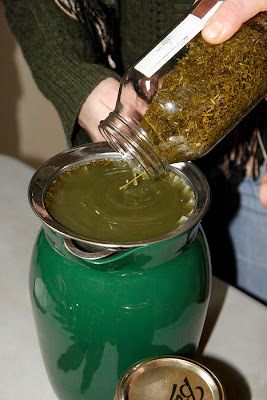 Everyone felt grateful for the medicine provided by red ceder, yarrow, and Oregon grape. We also made teas and infusions with various wild plants, including a dark, rich, coffee-like drink from the long tap root of the burdock. 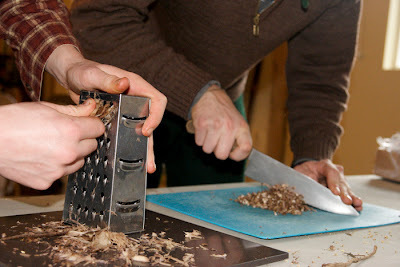 Here are Keith and Jason Millhouse processing the root before we roasted it. The final day was a very special day for the students, full of naturalist challenges and games. 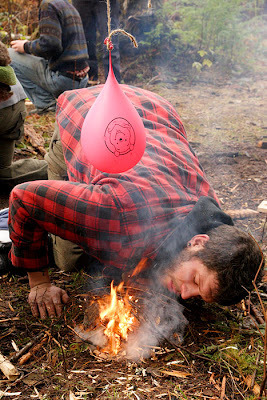 Groups of students got into some friendly competition in trying to see who could build a friction fire first and make it large enough to pop the water balloon hanging above. Students worked quickly, and persevered despite the abundant moisture that day. We also played a great blindfolded game with the entire class called Nutty Squirrels, involving teams of 2. One student would be blindfolded, while the other would steer him or her into "battle." No word-based communication was allowed, only gestures or sounds. The ammunition was "acorns" in the form of balled up socks. What a way to end before our winter break! Another spectacular outing with the Wildlife Tracking Apprenticeship ends, and with it that last tracking outing of 2009. This trip took us out to explore a new location over Stevens Pass and onto the East slope of the mountains. We had set our sights on the possibility of wolverine tracks and found ourselves exploring with new eyes. It did not take us long to find an interesting set of tracks crossing a road in the snow. These tracks moved around in loping gaits typical of many members of the weasel family. The tracks above are those of a large American marten. 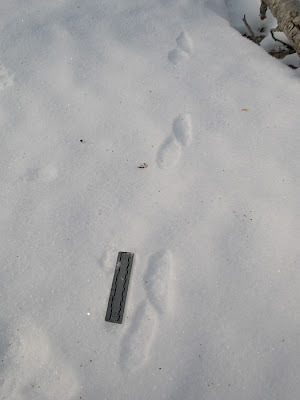 Following the tracks of this animal led us to find many other interesting tracks such as those of ruffed grouse, short-tailed weasel, Douglas squirrel, deer mice, bald eagle, river otter, beaver and others. The winter landscape itself was absolutely incredible to behold. 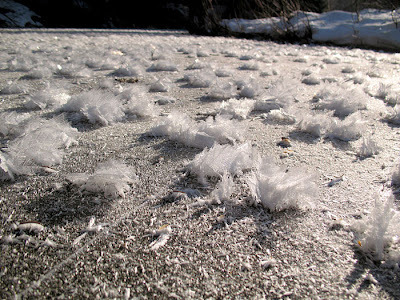 Frost formed fantastic shapes on the top of the frozen waterways we crossed and re-crossed. It was towards the tail end of our adventures, following tracks near the edge of a large meadow that we discovered something odd. We picked up a strange trail made of very worn, over-sized tracks. We debated exactly what sort of gait we were looking at and what animal made it. 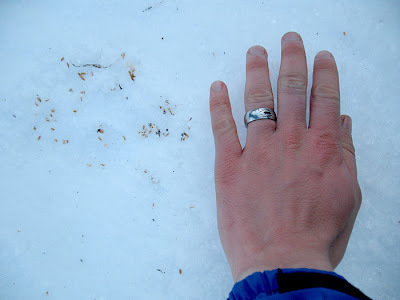 We considered that perhaps this was the wolverine tracks we had set out to see. We followed the trail as far as we could and found a few tracks that showed subtle toes. Four toes, and a blocky looking heel pad. 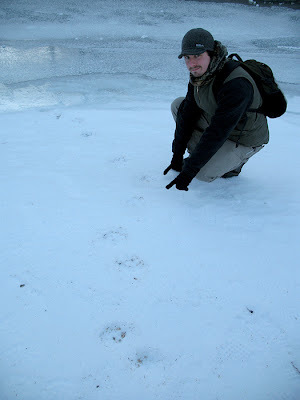 After much pondering, we came to the agreement that it was most likely tracks of another rare species in these parts... a Canada lynx. What a day! Looking forward to more tracking in the new year.